These biscuits are just as good as if you just cut them out and baked them fresh. Make a few batches of these biscuits on a rainy weekend, freeze them, and you'll have fresh biscuits any time you need them. Bake one or two at a time or a dozen—it's up to you. Biscuits are an excellent bread to serve with any meal, and they make tasty little sandwiches with leftover ham, turkey, or fried chicken. Biscuits are versatile, too. 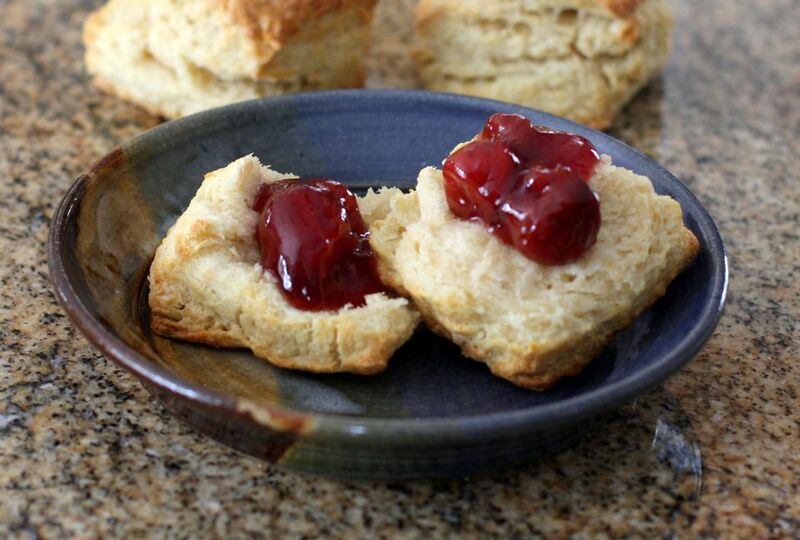 Split the biscuits and top them with sausage gravy or your favorite preserves or syrup. In a large bowl, measure or weigh the flour. Add the baking powder, soda, salt, and sugar, if using. Stir with a whisk to blend the dry ingredients thoroughly. Cut the butter into small pieces and add to the flour. Cut the butter in with a pastry blender or work in with fingers. With a fork, stir in the buttermilk until the dough is moistened and begins to hold together. Turn out onto a lightly floured surface and knead 2 or 3 times, just enough to form a cohesive soft dough. Pat out into a circle about 3/4 inch thick and cut out with biscuit cutters. Arrange the biscuits on a baking sheet, cover with plastic wrap, and freeze. When frozen solid, transfer the biscuits to a freezer bag and mark it with the date and baking instructions. Keep frozen for up to 2 months. The recipe makes about 12 to 14 biscuits using a 2-inch biscuit cutter, or about 10 2 1/2-inch biscuits. Arrange the frozen biscuits on an ungreased baking sheet. Bake for 15 to 18 minutes, until golden brown. Enjoy these tasty buttermilk biscuits with butter while they're hot. They're also great with jam or preserves, ham slices, or savory sausage gravy. You can also use the frozen biscuits to top a pot pie or casserole.